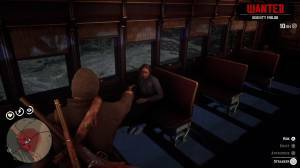 You can rob strangers and establishments, hijack a stagecoach, or even take over a train. These activities have severe honor loss so do this in moderation you want to maintain a good positive honor rank. You’ll also rack up bounty on your head pretty quickly if you do this without wearing a mask or if things go south where you’ll end up killing the town’s denizens or responding lawmen. Do this only if you don’t care about honor loss or if the loot will be worth the danger and bounty you’ll eventually have to pay. Robbing a stranger is pretty simple. Just aim your weapon at them using L2 and demand a robbery by pressing Triangle. Do this only when there are no witnesses otherwise you’ll have to deal with the witness(es) too. Take note that not all strangers respond well to robbery. Some of them may even fight back, forcing you to kill them before you can loot them. Women, rich gentlemen, and unarmed folks will be less likely to fight back while armed riders will most likely shoot back.